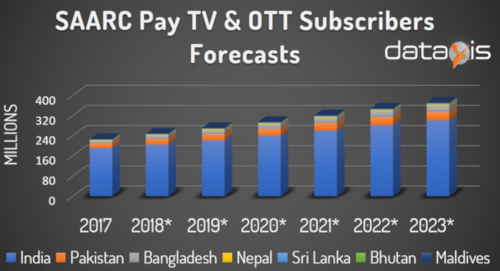 Following Dataxis latest research, Pay TV and OTT(SVOD) subscribers in SAARC countries are projected to reach 371 million in 2023, growing at a CAGR of 7.4% compared to 226 million in 2017. India is by far the biggest market among SAARC countries, accounting for 81% of the total Pay TV and OTT subscriber base. 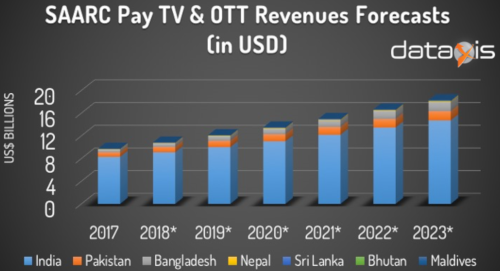 The Pay TV and OTT revenues in SAARC will be growing at a CAGR of 9.4%, accounting for US$18 billion in 2023. India will contribute up to 80% to the total Pay TV and OTT revenues, accounting for US$ 14.7 billion out of the total SAARC revenues.